Holmes Camp and Retreat Center, located a short drive north of New York City, is a 550-acre camp and conference center set among pristine forests, lakes, cliffs, trails and wetlands in the hill country of northern Putnam County/southern Dutchess County in the lower Hudson River Valley (click here for map). Ample free parking available for your event. The location provides a beautiful view of the area and spectacular changes of seasons. No matter when you are here, it is a good time to be at the Holmes. 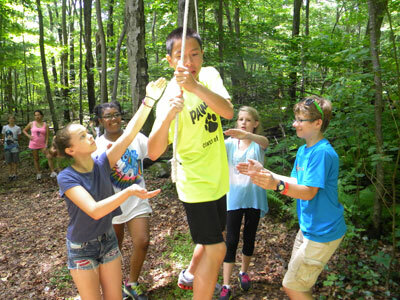 Holmes Camp includes two year-round conference centers, three year-round retreat cabins, two seasonal youth facilities, a rustic camping program, several tent/trailer and day group areas, and an environmental science and arts program. Three lakes provide the natural resource for swimming and boating activities, as well as winter fishing and ice skating. Holmes Camp provides programmed events, as well as rental facilities for self-directed conferences and retreats. Holmes Camp and Retreat Center is the outdoor Christian education and retreat facility of the Presbyteries of Hudson River, Long Island and New York City of the Presbyterian Church (USA) within the Synod of the Northeast, representing nearly 260 congregations and 55,000 members in the metropolitan New York area. We welcome all who want to attend our camping and conference programs, and no one is excluded because of religious belief, race, gender, age or national origin. To further assure parents that their children will enjoy a fun, safe, meaningful experience, Holmes Camp and Retreat Center has voluntarily submitted to the accreditation process of the American Camp Association. This organization is the only nationally recognized group governing youth camping professionals. Holmes Camp is certified as an Accredited Camp by the American Camp Association. Having this accreditation means we have met the highest standards in the quality of camp health, safety, programming, personnel and administration. The Rev. Bryan Breault holds a Masters of Divinity from Yale University as well as degrees in social work and theater. For twenty years, Bryan served Pilgrim Lodge, a United Church of Christ camp in Maine as Director of Outdoor Ministries. In addition to his strong camp leadership experience, Bryan also has a passion for faith development and social justice issues.